France orginally was part of the EFA (European Fighter Aircraft) project, which would result in the Eurofighter of today. In 1985 France left the project and started its own development of a fighter for the next century which led to the ACX or Rafale A. Participating countries soon choose to withdraw the project because of decisions to upgrade their F-16 fleets, not needing a replacement before 2010. 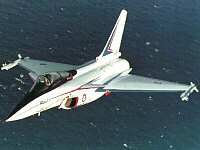 The Rafale prototype, A 01, first flew on 4 July 1986. 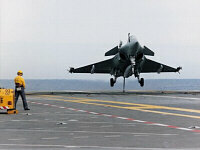 Developed from the Rafale A was the single seat Rafale C that first flew on 19 May 1991 and was followed by the Rafale M navilized version on 12 December 1991. The original plan is to order a total of 94 Cs, 78 Ms and 140 Bs. The first production aircraft Rafale B1 flew for the first time on 4 December 1998 and was delivered to the French Air Force. Deliveries are expected to run till 2009.